Excellent quality photos and video recording with a high quality 28x optical zoom for long range photography. Uses a 4.0 - 112mm lens, allowing a very wide focal length. Condition is Used although from the look of it you would not know as their are no marks or scratches. The P530 has wide 42 Zoom. Get stunning image quality the simple way with the Nikon COOLPIX B500. Focus on your subject instantly with Target finding AF technology that analyses your shooting conditions to rapidly identify your subject. You'll be able to choose the most fitting scene mode using the scene auto selector – pick from 15 options including Landscape, Night portrait or Close-up. Use the Mirror effect to display your subject and their mirror image in one shot, or Selective colour to add a bright note of colour to a black and white image. Condition is Used. Battery operated. Nikon Coolpix B500 Black Digital Bridge Compact Camera 16-megapixels With Case. Condition is Used. Dispatched with Royal Mail Signed For® 2nd Class. Perfect working order, 11 months old, brought to take on 2 special holidays no longer needed. Only used a couple of times. Can be collected. The lens looks perfect and the flash is working. It's lost its original lens cap so I'm including a 28mm infrared filter to double as a cap. Complete with its Nikon strap, original fitted soft case, two written manuals, software disc and a 128MB Sandisk CF card, all in excellent condition. In Excellent Condition, Tested Working. Supplied With Lowepro Case. Nikon COOLPIX L310 Digital Camera - Black With Case. Condition is Used. Dispatched with Royal Mail 2nd Class. Good cosmetic condition with nice case Untested so sold for spares/repairs Available for sale due to time wasters who havnt paid! Nikon COOLPIX L340 20.2MP Digital Camera With 32GB SD Card - Black. Condition is Used. No adaptor cable included. Comes with 7 unused batteries, a 32GB SD card and camera strap. Dispatched with Royal Mail 1st Class. Autofocus and zoom functionalities work well. Nikon neck strap. Lens and Optics are clear. Flash works well. Condition is Used. I think it`s worth £4.00. 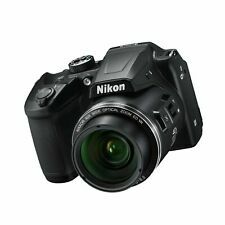 Nikon COOLPIX L340 20.2MP Digital Camera - Black. Condition is Used. Dispatched with Royal Mail 2nd Class. Used a handful of times however not enough to keep. Immaculate condition. Remarkable zoom for a small camera, as well as an impressive image quality. Truly do recommend, I just didn’t use it enough. 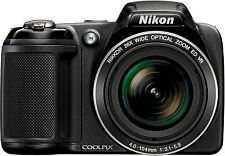 Nikon COOLPIX L340 20.2MP Digital Camera - Black. Dispatched with Royal Mail 1st Class. Nikon COOLPIX L20 10.0MP Digital Camera - Metallic black. Condition is New. Dispatched with Royal Mail 2nd Class. 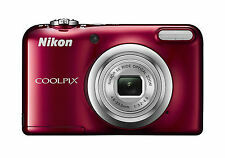 Nikon Coolpix L28 - HD Digital Camera - 20.1MP - Red. Condition is Used. Dispatched with Royal Mail 2nd Class. Purple Nixon Coolpix L29 Camera and case. Used - Full working condition. Slight cosmetic scratches to body due to use. No damage to screen or lens. Wrist strap attached to body. Free black camera case included. No batteries or memory card included. Offers accepted. Free postage! As the UK's number one heart charity, the cutting edge research we fund has already made a big difference to people's lives. Nikon SnapBridge compatible. Full HD movie recording. 3-stop lens vibration reduction. Extendable to 80x Dynamic Fine Zoom. Sony Coolpix L25 Digital Camera Black. 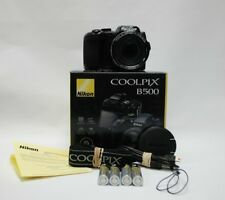 Excellent cosmetic condition and in good working order comes with discs USB lead 4GB memory card Nikon Case In Original boxes please view pictures. Will require 2xAA batteries to operate not supplied. Very nice example Will post UK only. Nikon Coolpix L810 Digital Camera. Condition is Used. Hasn't been used in some years. Comes with original box, manual and startup CD. Nikon Coolpix B500 Black Digital Bridge Compact Camera 16-megapixels. Condition is New. Dispatched with Royal Mail Signed Next Day Delivery. Brand new and opened once to check box. Nikon COOLPIX L810 16.1MP Digital Camera - Blue. I have had this camera for a few years but it’s only been lightly used. (iPhone more convenient). It’s in full working condition and has very few scuffs. The lens in in excellent condition as the cover has only been removed while photos taken. The screen at the back has very minor scratch which I have shown in the last photo. The body is clean with no chips or paint loss but has a few scuffs. There is no instruction book or CD-ROM with this as they went in the bin shortly after buying it’s all digital! I’m selling with all the accessories you see in the photo cables strap and case four rechargeable batteries and a 32 gig SD Card. The only reason I’m selling is I no longer use it . Please look at the pictures for further details. Good Used Condition, a few small scuffs to the screen at back but lens is unscratched and in excellent working order. 6 months WARRANTY. We provide a personal service and are always happy to help. It’s in very good used condition. 21 x optical zoom. It takes an sd card for storage. But has 100 mb built in. All the other specs can be found on the web. Used - Tested and Working. USED BUT IN FULL WORKING ORDER AND VERY GOOD CONDITION. It features a 16.1mp sensor and a huge 26x zoom lens. 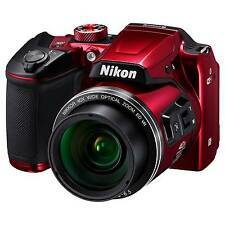 NIKON COOLPIX L320. This Nikon takes standard AA Batteries, (Not supplied, and also there's no SD card). Record your life effortlessly in high-quality images with the COOLPIX L340. NIKKOR 28X OPTICAL ZOOM LENS. NIKKOR lens with 28x optical zoom. Operation is simple, with features like Scene auto selector optimising settings for you, so you can concentrate on composing your shot on the large 7.5-cm/3.0-in 460k-dot LCD screen. Nikon COOLPIX precision optics, digital excellence and exceptional build quality combine to make great pictures. Built-in Flash: Yes. Digital Zoom Ratio: 4x. Zoom Type: Optical Digital. The handy Portrait Assist mode turns anyone into a great photographer. Nikon Coolpix B500 Black. 64gb fast sd card , case, Rechargeable Duracell batteries, tripod not included. Condition is mint , everything works perfectly. Manufacturer refurbished. Dispatched with Royal Mail 1st Class. Bought this about 4 months ago. Really impressed with the zoom and quality of the pictures that I have now purchased the P1000. Originally paid £250 for the Camera, it comes with the original box and instructions, a neck strap, lens cover and I will also give the case that I brought seperatly for it, which also has a neck strap. This camera has bluetooth on so you can transfer photos from your camera to your phone and it also comes with a wire to connect to your PC. Has minor scratches on screen as show in pictures. Very good camera, it never gets used so that is why I am selling it. 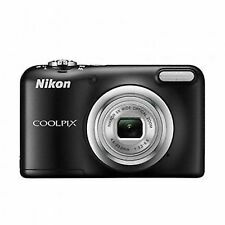 Nikon COOLPIX L340 20.2MP Digital Camera - Black. Perfect working condition. Given as a gift and used twice. Comes from a smoke & pet free home. Royal Mail 1st class signed for. 12 months warranty. Very good condition. 28x optical zoom lens. 4x digital zoom. 3in screen with TFT LCD technology. 112mm wide angle lens. Optical image stabilisation. extendable to 56x dynamic fine zoom. User's Manuel. Shutter speed of 1/1500 to 4 sec. Nikon coolpix L27 Black. Condition is used..My daughter has used it for her course at College..in good working order..comes with USB Lead and 16 GB..storage card.. Condition is New. Nikon CoolPix B500 - black. A tripod with a 3D head Mitoy case. 4 Panasonic Eneloop batteries. Neck strap. Sensitivity ISO 125-1600, ISO 3200, 6400 (available in automatic mode). Pictures: JPEG, movies: MP4 (video: H.264 / MPEG-4 AVC, audio: stereo AAC). Nikon Coolpix L840- used but excellent condition. NIKON COOLPIX L3 DIGITAL CAMERA - 5.1 Mega Pixels.